In 2 more sleeps I will be on my way to New York City, to the waiting and generous spare bed of my knitting pal Rebecca, then on Saturday it will be off to the New York Sheep and Wool festival, aka Rhinebeck. Wait, there’s something missing in that description, what was it…oh yeah: WOO HOO. I am so excited. I’ve been looking forward to this like whoa. It’s smack-dab in the middle of the term when both students and profs alike are getting a bit weary, and so far I haven’t had a bad trip to New York yet (knock on wood). For about a month I’ve been saying “I wish Rhinebeck was right now”, and soon it will be, yee-haw! I’ve got two or three vendors in mind that I want to get to first, and after that will be very happy to browse at leisure, and I’m hoping to run into a few of you fellow knit-bloggers out there too. 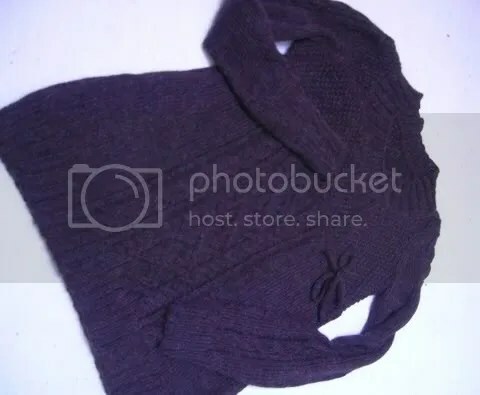 Also, word on the street is that it’s going to be sweater-weather this weekend, which means a wonderful parade of knitwear will be waiting to be ogled. Thankfully, my own Rhinebeck sweater has been completed and ready and waiting for a week now, and lo and behold, it is lovely. My Cabled Swing Cardi fits beautifully and I think it looks darned smashing. Sadly it’s a bit grey out right now and this is probably not the best light for photography…and it would be even better to be wearing it IN the picture, but a photo session just hasn’t been in the cards the past few days. I’ll try to make up for that on the weekend. Pattern: Cabled Swing Cardi by Norah Gaughan, in The Knitter’s Book of Yarn by Clara Parkes. Yarn: Berrocco Ultra Alpaca, colour “Lobster Mix”, 6.5 skeins. (This is much less than the 9 skeins the pattern calls for in the size I made. All evidence on Ravelry points to extremely generous yarn estimates for this pattern). I bought this yarn on sale at WEBS in the spring, and still have 3 skeins left. I’m sure I”ll think of something for the rest of it. It’s an extremely heathery brown, with shades of purple and red all mixed in, I’m pretty pleased with it considering I hardly ever wear brown. Needles: 4.0mm for ribbing and 4.5mm for the rest. Mods: The only changes I made were to add a couple of stitches on either side of the back to give it just an idge more ease on my shoulders – I have a fairly slim waist but slightly wider shoulders than most standard sizing accounts for given the size of the rest of me, so that’s a pretty common modification for me. I also opted for i-cord ties on both the inside and the outside front edges, instead of the button on the outside which the pattern instructs. I did this to allow more flexible ease to let me tighten or loosen the fit at the bust according to preference. All in all, I call this pattern a win. I completed it in just over a month and probably could have had it done quicker if I’d worked on it more dedicatedly in the beginning. 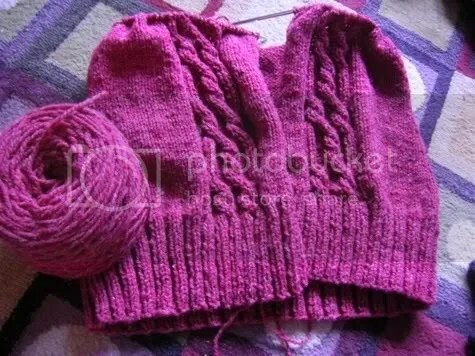 The cables are surprisingly intuitive on the front and once you’re finished those, the only other cabling is a small amount on the sleeves. I really like the double seed stitch texture at the top of the bodice. I have, naturally, already cast on for another sweater. We’ll see if it comes with me this weekend to keep me company in airports. If I don’t get back to the blog before the weekend – have a good one, whether you’ll be fondling yarn at sheep & wool festivals or no! Catch you on the other side. That is lovely! Can’t wait to see it modeled. Funny, I didn’t recognize it as that pattern – I like yours more than the one in the book. Your looks lighter/loftier. I always thought the one in the book, although a lovely design technically, looked too heavy, like it would be puffy and then stretch right off the shoulders. Perhaps it was just the yarn choice. Have all manner of FUN!!!!! 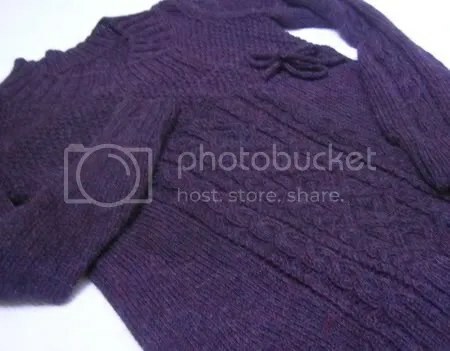 I wish I was going to Rhinebeck so I could trick you into giving me that sweater! Bwahahahahahahah! Seriously that is an awesome sweater! And I wish I was going to Rhinebeck to see you in it. It’s amazing – you pick really great, inspiring, classic, cabled patterns and then actually keep finishing them!! Another great knit to be worn with pride. Sweater looks great! I’m so jealous of all the sweaters you’re powering through lately. You are a machine! It takes me an entire week to spindle spin 35 measly yards of yarn and you crank out 1/2 a sweater! Sheesh! You’ll be the belle of the ball in that lovely sweater. Wow that’s gorgeous. I have some Ultra Alpaca myself (in lavender mix) waiting to become Ravensong from A Fine Fleece. Have fun at Rhinebeck! It’s beautiful! What an awesome Rhinbeck sweater. I love the colour! !